Lot Detail - Wayne Gretzky's 1973-74 Brantford Hockey Team "White Tornado" Cooper Game-Used Gloves – Worn at Quebec Pee-Wee Tournament! – From Gretzky Legal Guardian Bill Cornish's Personal Collection! 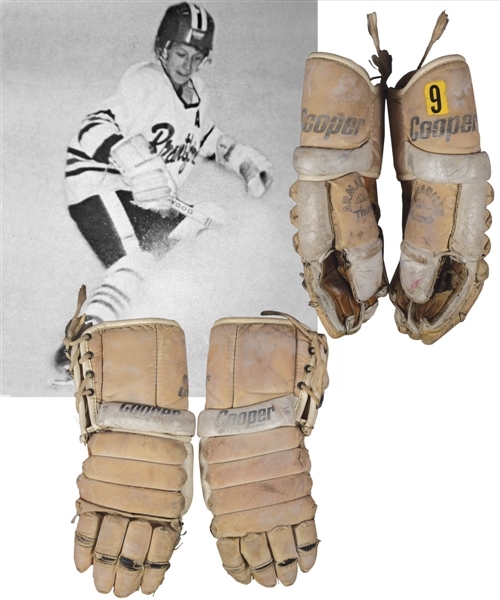 Wayne Gretzky's 1973-74 Brantford Hockey Team "White Tornado" Cooper Game-Used Gloves – Worn at Quebec Pee-Wee Tournament! – From Gretzky Legal Guardian Bill Cornish's Personal Collection! 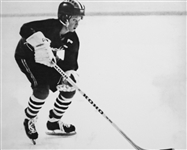 First nicknamed “The White Tornado” for both his youthful speed along with the white gloves he donned, Wayne Gretzky exhibited his sheer dominance and goal-scoring prowess especially early, netting an unfathomable 378 goals in just a mere 85 contests for the Brantford Nadrofsky Steelers at age 11 in 1971-72. Representing his earliest days when he was quickly ascending the hockey ranks, ready to set the sporting world on fire, we have a pair of “White Tornado” gloves worn by a young Wayne Gretzky in the 1974 Quebec Pee-Wee tournament and photo-matched to his time with Brantford, with the impeccable provenance of hailing directly from Bill Cornish, Wayne’s legal guardian at the time. Light beige Cooper models with intact tie-strings, white colouring is present over the thumbs and finger joints as well as the wrist and index finger padding, with a glossy yellow decal with solid black “9” positioned over the left glove’s wrist guard. 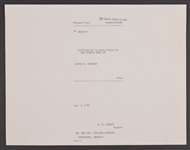 The original document that gave Bill Cornish and his wife Rheta guardianship over Wayne will accompany, with these world class gloves serving as THE EARLIEST PHOTO-MATCHED WAYNE GRETZKY ITEM TO EVER HIT THE AUCTION BLOCK. An LOA from Bill Cornish will accompany. 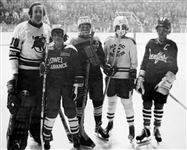 We should note that it is documented that Wayne wore white gloves in 1973-74 when he participated in the Quebec Pee-Wee tournament, with these particular specimens worn in the 1973-74 tournament. Regarding the important photo-matches, a number of included numeric images clearly show the proper placement of the Cooper lettering over the wrist guards on each glove, with the single “9” decal over the cuff of the left glove along with it’s placement perfectly matching the images. As previously mentioned, the gloves originate with Bill Cornish. Named the legal guardian of Wayne Gretzky in June of 1975 as his parents, Walter and Phyllis, had decided Wayne would play his junior hockey in Toronto, Bill was the general manager of the Toronto Nationals bantam team, and he is credited with the idea of having Gretzky play in Jr. B when a legal battle arise for Wayne to play in the MTHL. When a young Great One arrived to stay with the Cornish family, he was sporting the offered gloves, but they were retired and saw no future use as his team gave him new gloves.